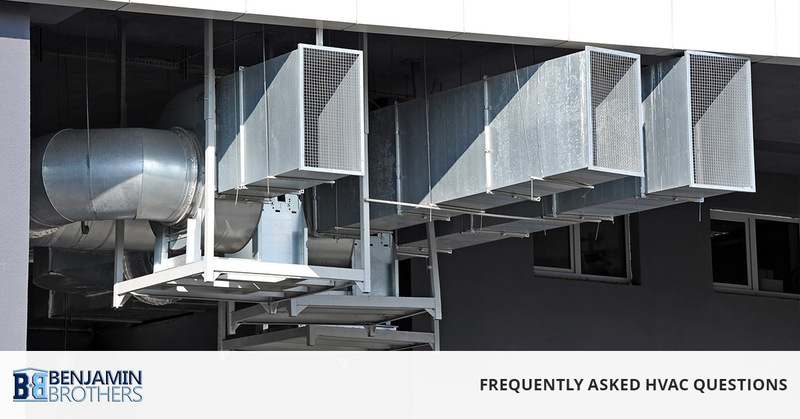 When it comes to your HVAC system, you might have quite a few questions. You know that this system is in charge of heating and cooling your home, but what about the other things you need to know to keep this machine running smoothly? Our professionals at Benjamin Brothers are here to answer those questions for you. Read on to learn more. HVAC stands for heating, ventilation, and air conditioning. However, the term HVAC is usually used to include all the parts that make up this system, including ducts, air filters, and humidification controls. Your HVAC system is in charge of ensuring that your home remains at a comfortable temperature, both through the summer months and the winter months. Why do my ducts pop when the furnace starts or stops? If you have been hearing a popping noise when your furnace flips on or off, it is usually a sign that your ducts are undersized. This may have something to do with having more air trying to flow through than the duct work can take. We can take a look at your home’s ventilation system to ensure that you have the proper design to meet your home’s requirements. If there are adjustments needed, we can provide a quote for you. Do I need to get regular maintenance on my HVAC system? Yes! If your car got a flat tire, would you replace the car or the tire? When your home has a leak in the roof, do you patch the leak or buy a new house? Your HVAC system will serve your family for years to come as long as you are diligent about taking good care of it when needed. Routine maintenance is a great way to keep your HVAC running smoothly and efficiently. Can the air indoors be bad for my health? It sure can be. In fact, the air pollutants in your home could be up to 100 times what you would encounter outdoors. The American Lung Association has found that most people spend around 90 percent of their time indoors, which means that the quality of our air is extremely important. Compounds found in typical home furnishings, such as upholstery or carpet, can emit fumes that make our indoor air less healthy to breathe. When our homes have poor air quality, we can suffer from symptoms like headaches, nausea, and difficulty breathing. Proper ventilation can keep our indoor air quality better and reduce the pollutants. Could my HVAC be affecting the odors inside my home? It could be, yes. Dust mites, bacteria, and pet dander can all affect your home’s odor. This issue is only aggravated when you do not have the proper ventilation set up. If you notice any moisture condensation on your walls or windows, then it’s time to call the professionals at Benjamin Brothers to come take a look. How often should I have maintenance done on my HVAC system? We recommend having maintenance done annually. Specifically, we recommend the spring to summer months! This allows us to test anything we need, as well as get a good idea of any potential problems that could arise during the year. Is there a way to increase my home’s heating and cooling system’s efficiency? Yes, there are a few ways you can do this. We recommend cleaning and replacing your filters frequently. We also recommend keeping your blower in the “on” position, as this allows for your system to heat and cool your home much more evenly. Plus, when the blower remains on, this allows for constant air movement through the home. Finally, you can install shades, screens, shutters, and drapes on any windows that may be in direct sunlight. This can keep out the heat and decrease the amount of energy your cooling system will need to keep your home comfortable. Should I try to keep my air conditioner running as little as possible? In general, a unit that is either on or off is going to be less expensive than one that keeps going on and off on its own. This is because every time your AC unit starts up, it uses quite a bit of electricity – and it produces very little cold air. However, a smaller unit that remains on may not provide as much comfort as you would like. You can discuss the pros and cons when you contact Benjamin Brothers. When it comes to the comfort of your home, don’t leave anything up to chance. Benjamin Brothers is here to help you as you set your home up for both the hot summer months and the cooler winter ones. Call us today to get started, schedule your appointment for installation or repair, or to learn more about your home’s HVAC system and how we may be able to help.